In a long running campaign involving the the forces of undead, you are going to need lots of NPC names. 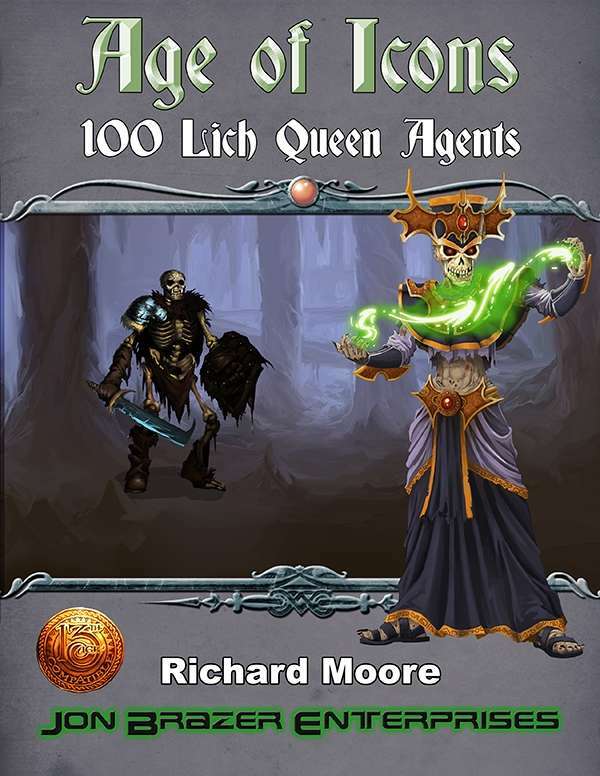 Age of Icons: 100 Lich Queen Agents is here to help. This list of 100 names will give you the inspiration you need for when you are planning your next gaming session. Additionally, 5 of the agents in the list receive full stat blocks; each comes complete with relations to the other icons, giving you hooks to create your own adventures with. Beautifully illustrated, this supplement is ideal for your campaign. Never be caught unprepared when GMing a lich and her agents. The Icon is called The Lich King: is this called the Lich Queen because of a licensing issue? The icons are not open content. We cannot call an icon the Lich King. So we made an icon that is *nudge, nudge, wink, wink* different.